Perhaps some things are better left alone. For instance, I recently visited the offices where I used to work. The building was brand new in 1979 when I leased those offices, at first the 2nd floor of the three story building, eventually occupying the entire building and the one next door as well. The last time I was in the building was about eight years ago. Since then the interior was reconfigured leaving a maze of cubicles and now the company has changed ownership. The offices are being closed and there remains just a skeletal staff in the transition phase. So, it was a bittersweet return, seeing a few people with whom I had worked, reminiscing about the “old times.” As I left the building this one last time, it was with a sense of sadness I thought I had already overcome. You can’t go home again. There are certain memories you should put away in the museum of your mind, leaving them perfectly preserved in their protective cases. 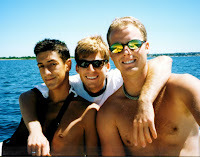 In a sense, the many days we spent boating to Block Island have become such a treasure. Perhaps that is one of the reasons when we last left the Great Salt Pond of Block Island a few years ago, I suspected we might never return. Not having gone back, that sense of not wanting to revisit what had such an impact on our lives, has been reinforced with each passing year. Those were our adult to later middle years and now, with our children grown, and with the rigors of boating becoming more challenging as we age, not to mention the explosive expense of fuel and dockage, Block Island is now just a wonderful memory. For us the journey began in our little 28’ boat in 1984 -- ‘Spindrift’-- equipped with not much more than a compass and a VHF so our ninety mile trip from Norwalk, CT through the infamo us “Race” with its frequent fog, turbulent water and numerous fishing boats to navigate around, into the Block Island Sound, exposed to ocean swells, and finally into the Great Salt Pond of Block Island, was an adventure. We relied on compass headings and visual sightings of certain buoys, zigzagging our way there. The first couple of years of venturing to Block we tried the docks at both Champlain’s and the Block Island Boat Basin, the advantage of the former being its salt water pool that our then 8 year old Jonathan loved, and the latter their floating docks – easier on and off the boat and no rafting (boats tied together, strangers trouncing across your boat to get to the dock). Here I must detour in the story of our Block Island days. At this time we befriended Ray and Sue who have a son about the same age as Jonathan. Then we were at the same Marina, Norwest Marine in Norwalk. I briefly mentioned Ray in my article on Crow Island but I failed to mention how critical he has been to the story of our boating life. 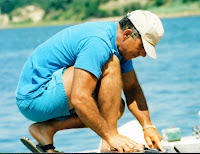 Ray was my boating mentor, and there could be no better one. Ann and I have joked that if we were marooned on a desert island, he would be the one person we would want at our side. Give him a roll of duct tape, rope and a few other materials and he will build you a cathedral. In boating you can find yourself in unpredictable situations and Ray has frequently bailed us out. One time we arrived at Block taking on water because one engine’s muffler had burst and in the infinite wisdom of the boat manufacturer, this was below the water line. No problem for Ray, who immediately sized up the situation and decided to temporarily plug the exhaust with a large plastic coke bottle, a perfect, secure fit, stopping the leak until we could replace the muffler. Continuing the story, my friend John was flying over to Block where he had left his boat with his wife Cathy and their two children, and he said, no problem, picking up a replacement muffler and between Ray and John, the repair was made, a perfect example of boating camaraderie and cooperation. Ray showed us the path into Crow Island, long before the GPS made it a more accessible destination and it was there that our families spent countless weekends. Due in large part to his encouragement, in 1985 we bought a 37’ powerboat, and as a much younger man, I fearlessly took our new ‘Swept Away’ all over the Long Island Sound and its ports on Long Island and Connecticut sides, plus Newport, Cuttyhunk, Edgartown, and Nantucket for several summer vacations in subsequent years. 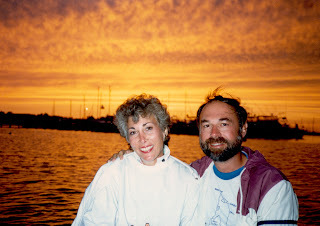 We cruised to those ports without Ray and his family as by that time he was convinced that there was only one port really worth going to, settling down for his summer vacation on their 44’ ‘Rascel’, at Block Island, and, specifically Payne’s Dock. So, on our way back from one of our more distant ports we would stop at Payne’s to visit for a few days and, gradually, like Ray and Sue, we found ourselves spending more and more of our vacation time at Block until, we too, found ourselves going there for our entire summer vacations. Payne’s is an enigmatic place, a community like no other we’ve visited on the water. It’s not just a dock, but an ongoing event, the same boaters showing up at about the same time, and settling into routines as mundane as hanging around waiting for the coffe e to be made at the top of the dock, ordering a few or more of the homemade donuts we lovingly referred to as “sinkers”, sitting around the ancient wooden picnic tables sipping coffee in the frequently fogged in morning, to the evening libations at rickety Mahogany Shoals. Payne’s rafts boats during the crowded weekends but always seems to be able to match up compatible boaters. To watch Cliff Payne and his “dock geezers” move around boats, slipping them in and out of tight quarters was to watch a comical, sometimes nail biting, but effective chorography. One weekend our older son, Chris, surprised us by biking 75 miles from Worcester, MA to the Block Island Ferry at Point Judith, RI, arriving with enough energy to join us and friends at Ballard’s in Old Harbor for lobster and then we all danced the chicken. Chris clucked and flapped his wings, none the worse for wear after his long bike ride. 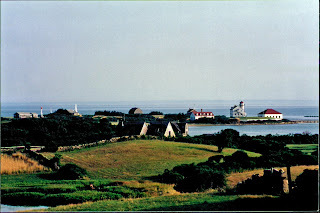 After morning tasks, our families would dinghy to the eastern side of the Great Salt Pond, leaving our little boats, cross the Corn Neck Road causeway and settle in at Scotch Beach on the Atlantic Ocean for the day. Block has been called the Bermuda of the north for good reason, the water crystal clear, the waves perfect for body surfing which the kids did most of the day (OK, the adults too when we could grab their boards). Then, back to our boats, shower, and its cocktail time and pot luck dinner on someone’s boat. We called fluke fishing at the mouth of the harbor “meat runs” as we were sure to catch that night’s dinner. Again, Ray was the leader of the pack, both in organizing those fishing parties and filleting the fish like a surgeon, squeezing every drop of edible fish leaving the waiting seagulls disappointed with the remnants tossed off the dock after surgery was completed. Then there might be a “cook off,” the ladies preparing the fluke different ways, or sometimes as teams. To watch my wife, Ann, and Ray’s wife, Sue, cook in the galley was exhausting, pots, pans, plates, being passed back and forth in tight quarters, those beautiful, sun baked faces, flush with a cocktail or two, we expectantly awaiting the outcome of their culinary skills. Frequently, meals were served to accommodate an entire boatload of friends, everyone balancing plates and drinks in the cockpit. These feasts continued night after night, always with high praise heaped on the amazing kitchen crew! Once we went tuna fishing off of Block. But I was the “accidental fisherman,” mainly going along to photograph the activities. The party thought it might be a good joke on our way back, after everyone had caught a yellow fin tuna in the 80 pound range, to watch me try to reel in one, using a stand-up belt (no fighting chair on the boat). They laughed as I struggled with the reel and the belt kept falling to my knees as my waist was too small, but I had the last laugh as I finally reeled in a 200 lb blue fin tuna. I couldn’t lift my arms for hours. Most of the tuna was sold at the dock at Montauk but we filleted one for ourselves and grilled it on the dock at Payne’s that night. When not cooking up, we would pile into one of the cars that one of the family’s brought over on the ferry (this became the main means of transportation to the beach after our boys turned driving age), and went off to one of the many joints on Block Island, ending up at the one and only Ice Cream shop, which brought us to the Old Harbor, where the shops were. And when not at the beach, there was always a bike ride around Block, challenging because of its steep hills. At one point we figured out ways of staying longer at Block, leaving our boats and families, taking the short flight to Westerly Airport where we would leave a car to commute back to our Connecticut offices for a few days to attend to business. On a couple of occasions we charted planes to Bridgeport Airport to attend to business, stretching out our Block Island stays. While our own boating lives have changed considerably these last few years, Block Island remains the prized destination in our boating memory.